She loved her fancy Christmas dress when she was a tiny girl. Nothing has changed now that she's a teenage girl: it's still about The Dress! Find the best Christmas & Holiday party dresses for your elegant young lady with our latest 2018 collection for tween girls: discover lots of cute dresses in exquisite styles, all at affordable prices. Get high-quality designer & brands, perfect for every Christmas occasion and event your girl will attend, from family dinners, parties, and even school celebrations. From short or long pieces, smocked, classy or fun gowns, with amazing designs, to red, white or colorful Xmas outfits ideas, we've got you covered! Shop beautiful holiday dresses and let your princess wow them all with her lovely presence! Get inspired by more Christmas dresses and outfit ideas for Tweens! Sleeveless gown by Chic Baby will highlight her unique style and make her shine at her next festive event. 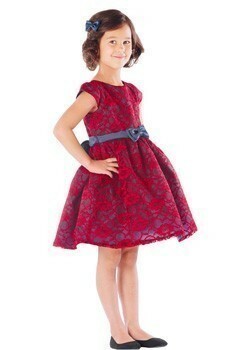 Exquisite style exuding style and understated elegance, this Bijan Kids dress brings out an extremely feminine look. An exquisite style for her next festive occasion, this My Best Kids gown will put a smile on her face and fill her heart with grace. A great piece by Good Girl fit for a fashion girl who wants to discover style and beauty. An exquisite dress by Huncho fit for a princess who wants to shine and take front stage. This blue and red elastic neck short sleeves dress from Little Miss Fashion is perfect for your girl. This gold sequins long sleeves dress from Little Miss Fashion is perfect for your girl. Cap sleeve lace dress with clear stone trim belt by Just Kids. A perfect blend of finesse and style this Sweet Kids dress is sure to become a must-have for special occasion. With its shimmery texture this trendy dress by RMLA is a Christmas treasure, great to be offered as a gift or a cute piece to wear during the winter holiday. Focus on style and beauty with a special occasion gown by Bijan Kids. Update her look with a special occasion gown by Bijan Kids. A dress for festive events, timeless style by Kids Dream. Outstanding customer service and fast reliable shipping makes shopping for Girls Christmas Dresses fast, fun and hassle-free. Our Christmas dresses for girls are in stock and ready to ship. Add holiday Hair Accessories and a perfect pair of Girls Shoes to compelte her look.